Everything is calm, at the Temporary Migrant Accommodation Center in Chișinău's suburbs. Someone is slowly tidying up outside. Some migrants quickly glance out of the volleyball field, over the nets and the gates, while playing in a lazy game with a couple of policemen. This is the first and only center of this kind in Moldova. It was inaugurated on April 4 th, 2008 , with funding from the European Union and the support of the International Organization for Migration (IOM). Four years before, the Moldovan legislation had already foreseen it (government decision no. 71, 30 January 2004), but the government lacked the resources to build it. The whole complex actually started operating in 2011, as only part of it was inaugurated in 2008. As IOM's Simion Terzioglo highlights, “The Moldovan government sometimes used 'non-relevant' systems, to apply its laws, such as imprisonment; fortunately we have this center, now”. The plates on the walls of the three main buildings act as a reminder of the cooperation of Italian, Finnish and German donors, amongst others. The Center presently hosts 14 people, among whom are three women. One of the three buildings of the complex is still empty but should serve women with children. These spaces, though, equipped with playgrounds surrounded by fences and barbed wire, were only used once, by a mother with her two children. The migrants mainly come from the Russian Federation, Ukraine and Turkey and some from the Middle East. Director of the Moldovan migration and asylum department Olga Poalelungi states that “there are some citizens from the EU, but they are rare”. Among the 375 migrants who have transited through here since 2009, the EU or US citizens have been rare and mainly linked to Romania and expired residence permits; this was the case of a Hungarian and two US citizens: one of them was born in the Soviet Union, moved to Moldova from the US and stayed without the necessary papers. Poalelungi states that “the 6-month maximum period of stay is rarely reached; on average, they stay 2-3 months. As of now, we have reached 14 bilateral agreements with single Countries and negotiations are ongoing with 27 other Countries, including Russia”. Why do these people emigrate to Moldova, notoriously one of the weakest economies on the European Continent? According to Terzioglo, “almost all of them are transiting to the EU and Moldova is not their final destination. Many choose the route from Ukraine to Romania, but some prefer to pass through here. Sometimes because it is easier to avoid checks or because the land is less impervious”. 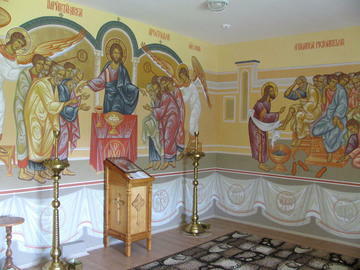 For the present figures, the Center is well kept, it has wide spaces for common activities and two places of prayer, one Orthodox Christian and one Muslim. Migrants can count on legal, psychological, social and medical assistance. The Doctor of the Center explains that “many of them get here in precarious health conditions: the cases of frostbite, scabies and tuberculosis are not rare”. For the first three years, some NGOs dealt with projects that included social activities within the Center. There is nothing of that, now. Besides the meals, there is only “spare time”. For Simion Terzioglo, “we need to wait and see what will change when Romania enters Schengen. The number of illegal immigrants is probably going to increase greatly. The Moldovan government makes huge efforts to support operating costs but if expenses increase, it will be difficult; the government will surely have to increase personnel”. According to official data, the Center can host 120 people; 200 according to Terzioglo, a worldly expert. The rooms are spacious and only some peculiarities recall prisons, i.e. bars on the windows, gates, chairs and brick tables. Two hundred migrants in these spaces, though, leads to think of scenarios where it will be difficult to maintain total respect for their dignity. The Center in Moldova is not an isolated case. It was part of a European migratory policy that involved all Neighborhood Countries. Even the authoritarian Belarus has accepted this logic since a few years ago. The EU aims at a 'border externalization' to anticipate and reject 'illegal' migrants before they enter the Union. 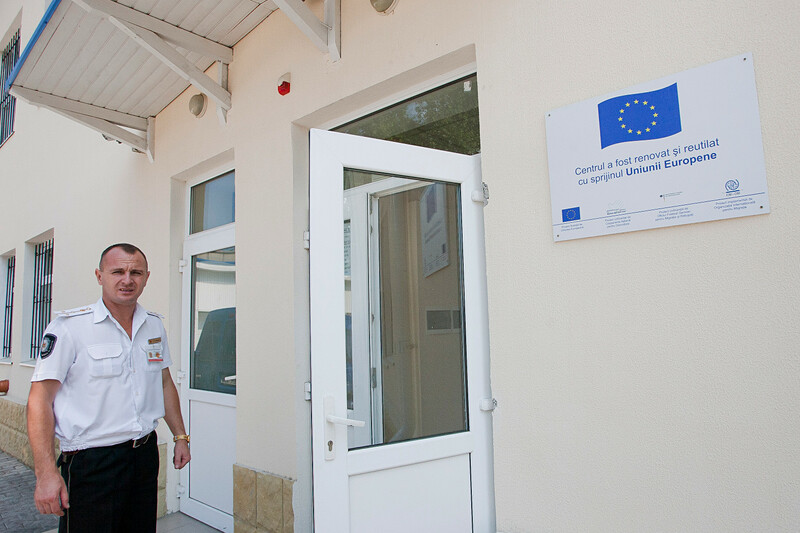 The Temporary Accommodation Center in Moldova falls under this picture. As a Country attracting a low number of migrants, it clearly pinpoints another important aspect: the tackling of security measures on immigration even before such policies are needed in the Country. It is thus getting ready to “defend” the Union for when the Schengen border will be along the Prut. And, if one day it is part of the EU, it will already have its first functioning “Identification and Expulsion Center”. Among the guests, M. is an exception. He is from Ghana, “but he says he's French”, the Center's director states. “I lived in the EU since 2003: France, Italy, Denmark. I'm originally from Ghana, I would like to go back, it's my home”, M. says with no fear. He also tells us about the Moldovan warm-heartedness, his fake papers, the respectful manners of most of the Center's policemen. He also speaks of the migrants who are sent back to their Country, with no money in their pockets and to cities that are so far away from their homes. Right after that, the director underlines that “he has no papers, as most of the guests. Last week, the French Consul paid a visit, but he did not recognize M. as French”. What do you do in these cases? “If in 6 months the nationality a migrant is not identified, they receive a Tolerance Paper for 6 months. Within those 6 months they have to leave the Country. They are usually in Romania soon after”. What is the purpose of “accommodation” centers such as these, then? Most of the people here are locked-up for months and then sent back to the streets of the Country and probably start their journey back from where they had left it. Those with expired residence permits would probably be more easily dealt with when not locked-up in some facility. In this phase, however, Moldova, as other Eastern-European States, makes this security logic its own and pays its dues.